Are you looking for the perfect location for a performance or charitable event? Have you ever considered a gorgeous art deco theatre fully equipped with 1,772-seats, expansive lobby, balcony promenade and a sun-drenched Atrium Gallery? More than just a beautifully restored historic theatre, the Warner Theatre complex includes educational classrooms, rehearsal studios, a black box-style studio theatre and countless meeting rooms, lobbies and more. Each unique space is available for rent either separately or as a package. Perfect for educational lectures, humanities-related meetings or charitable functions, the Warner Theatre has a space ideally suited to your needs. Rental of 1772 seat main theatre includes the use of the lobby, balcony, atrium gallery, and dressing rooms. The theatre is equipped wih state-of-the-arts theatrical lighting, sound, and high definition video projection. Convertible "black-box" space with state-of-the-art theatrical lighting, sound, and video systems. An open concept lobby and gatering space available on non-performance times. Featuring rotating local art exhibits currated by Five Points Gallery. 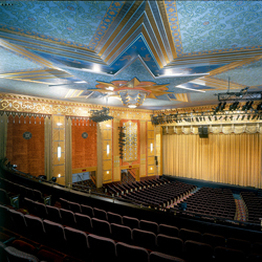 The main theatre is equipped with state-of-the-art computerized sound and lighting equipment. A technical package, which includes house lights, house sound, and on-sight supervisory services of a Technical Director, is available for download. While the Warner Theatre does not provide catering, we are happy to provide you with a list of recommendations of local purveyors. The use of the bar station in the lower lobby is included with lobby rental. Bar service may be arranged with your rental. The full use of our box office facilities and ticketing capabilities (including web marketing and sales) are available for an additional fee. Marquee advertising is included with rental (subject to timing availability). The Warner has a limited supply of tables and chairs for lobby and Atrium Gallery events, which is included in the rental fee. We are also happy to make recommendations for outside rental options.